Another comic that was bought for my brother Ken, during a period in which he, influenced by me I expect, would want a comic when I got one rather than some candy or a small toy or whatnot. Here, it’s another solid issue of the Julie Schwartz-edited SUPERMAN title. It’s not a bad cover, though Superman looks a bit bloated in the chest to me, and Thunder’s face and expression are more comical than horrific or terrifying. 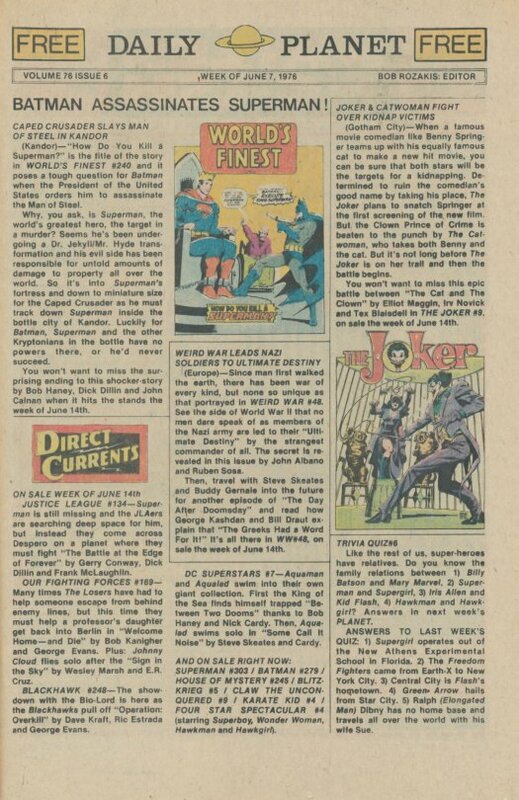 The story is by the recently-emigrated Gerry Conway, then a newly-hired editor at DC, here working under the guidance of editor Schwartz. 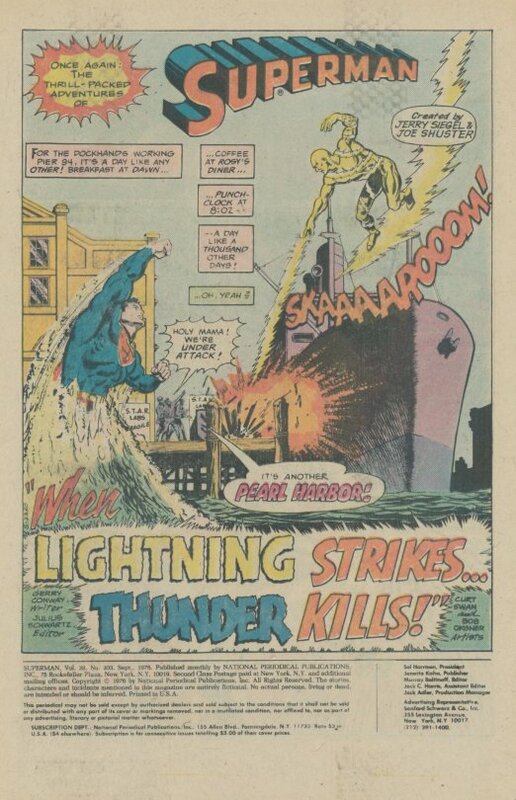 And so he tries to bring some of the Marvel flavor that was being evidenced in the titles he was editing to this story–Lightning and Thunder feel closer to Marvel villains of this period than typical Superman foes–but is forced to focus more on plot than characterization or battle by the always-stern Julie. But even with all that, Conway’s Marvel leanings cannot be disguised. 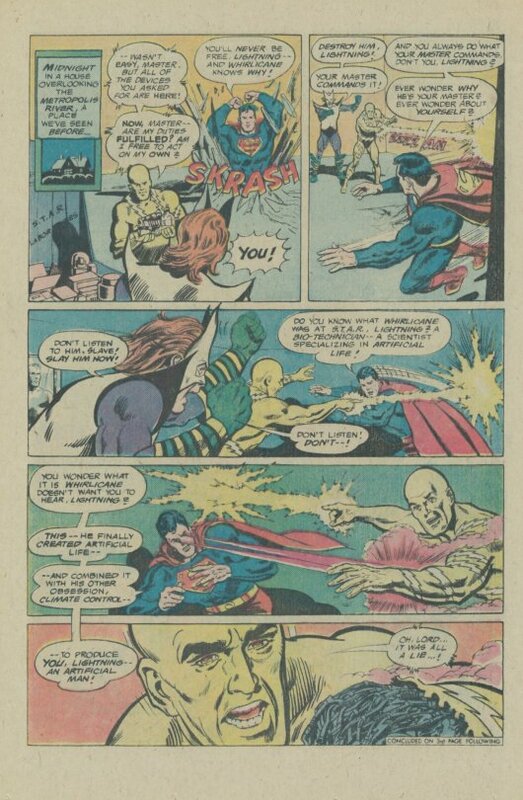 And so the issue opens in mid-action, as the on-patrol Superman comes upon Lightning, a mysterious gold-garbed superhuman, attacking the Metropolis docks. The Man of Steel flies to the rescue, mixing it up momentarily with Lightning–but a second after Lightning knocks him back, the golden warrior is replaced by the more brutelike Thunder, who sonic blasts the hero into orbit. Superman intends to take Thunder by surprise by circling the globe and returning to the attack from the other side–but as he passes through Borneo, he comes across a monsoon ravaging the countryside and must divert to come to the aid of those in trouble. By the time the danger has passed and he’s able to return to the scene of battle, his enemies have disappeared. At the site, Albert Michaels, the head of S.T.A.R. 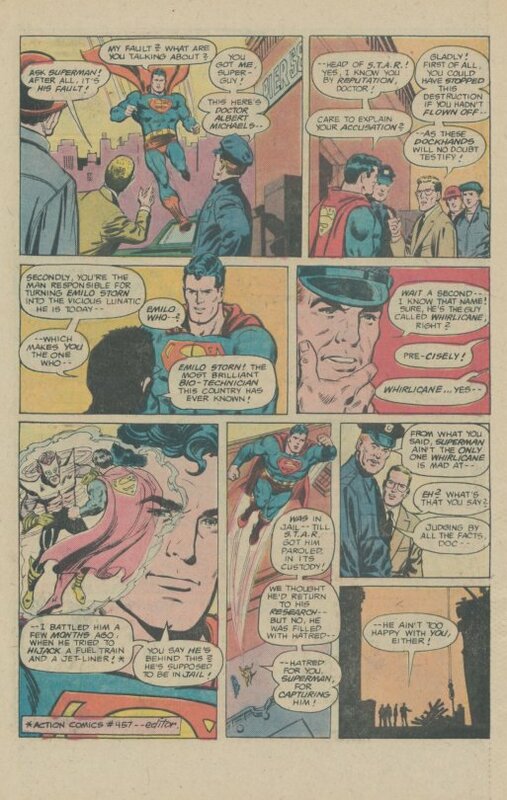 Labs, blames Superman for the situation, indicating that the one responsible for it was really Whirlicane, a villain that Superman had battled in the recent past who had been a top S.T.A.R. scientist. Returning to WGBS to do his regular evening broadcast, Superman intends to track down Lightning and Thunder afterward but instead gets himself a dinner date with Lois Lane, who is still infatuated with him after the backbone he’d shown in the recent tale in which Superman had to choose between his two personas. This is another bit of Marvel-style plotting, where previous stories have an immediate impact on the story at hand. Elsewhere, Whirlicane chastises Lightning for failing to bring him the S.T.A.R. equipment he’d sent the minion after. We pause the story at this point to highlight my first look at another book that I lusted after, the upcoming Treasury Edition featuring the Superman vs the Flash races. Inspired by the success of the recent SUPERMAN VS THE AMAZING SPIDER-MAN Treasury Edition, DC looked for other similar projects they could put into the pipeline, and the first to press was this one featuring two of my favorite heroes. It was a book that I had to have. In the fashion of a true cad, Superman causes a tire blowout that causes Lois to be drenched with rainwater, bringing their date to a premature end so that he can go in search of Lightning and Thunder. He finds Lightning attacking another S.T.A.R. Labs facility upstate in Larchville, but as he battles Lightning, he is once more surprised by the sudden appearance of Thunder. 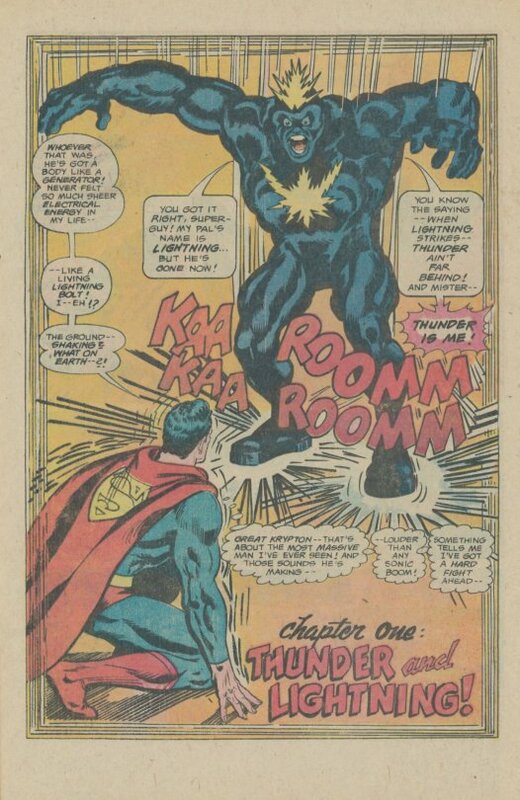 Turns out that both villains are actually one and the same, a criminal that Whirlicane had turned into a dual super-menace–one that diverts Superman by imperiling Arizona by attempting to detonate some cannisters of nerve gas with a subsonic wave. 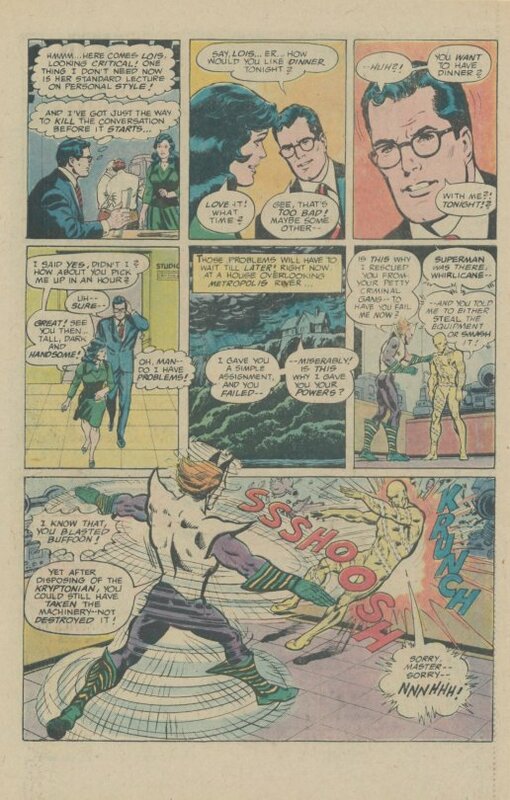 Superman prevents the detonation of the Nerve Gas, then trails Lightning to Whirlicane’s lair, where he reveals to the twin villain what he’s worked out: Lightning’s origin is a lie, he’s really an artificial being created by Whirlicane. 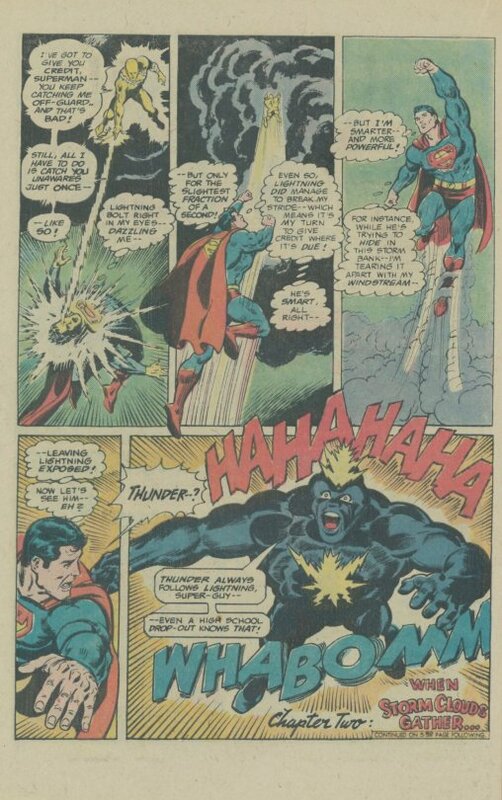 But Superman’s revelation backfires as, confronted by the truth of his existence, Lightning self-detonates, destroying himself and Whirlicane. A strangely unconcernd Superman is the only thing to survive the explosion,and he’s so unaffected by having caused the deaths of two sentient beings that he heads off to resume his evening with Lois Lane. Not the big guy’s finest moment. 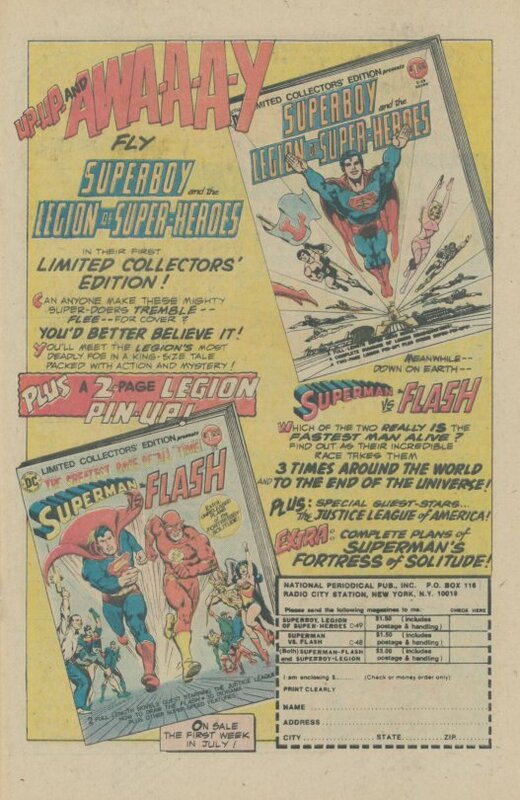 Finally, that week’s edition of the Daily Planet promotional page let me know that I’d want to be looking towards my mailbox, for JUSTICE LEAGUE #134 was about to drop.